The purpose of P.W. is to nurture our faith through prayer and Bible study, to support the mission of the church locally and worldwide, to work for justice and peace, and to build an inclusive, caring community of women that strengthens the Presbyterian Church (USA), and witness to the promise of God's Kingdom. PW works to support over twenty-five different missions. To that end, quilts and clothing are produced and given away locally and abroad, baby items are collected for the YWCA Teen Closet and Christmas gifts are given to Ledgeview Nursing Home. 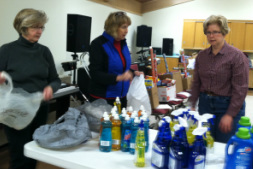 Meals and necessities are provided to people at Freedom House, Golden House and Green Bay Community Shelter. Mosquito nets for the Networkers Project Against Malaria are financially supported. With the help of the congregation's donations and the handiwork of Mary's Circle, we are able to donate many schoolbags filled with supplies and many fully stocked health kits to Church World Services. 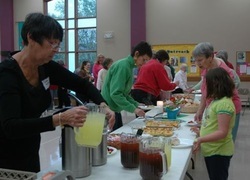 Annual fund-raisers include rummage sales, used book sales in May and November, election day bake sales, Christmas cookie bake, winter soup/bread sale, preparing and serving meals for various church groups and Presbytery-sponsored events and collecting grocery store receipts. Direct donations are also received, including the "Bag of Thanks."